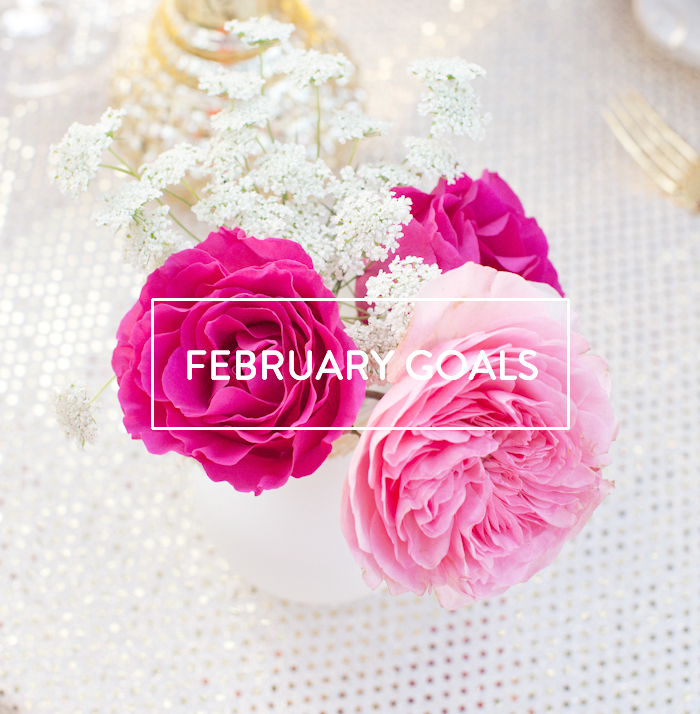 February has begun and that means it's time to share my monthly goals! I absolutely LOVE February! It's one of my favorite months EVER because it is focused around LOVE! I'm such a mega cornball, and sucker for all things romantic. I spent Friday (February 1st) placing colorful carnations around my home and added a couple pops of pink to my kitchen. To say I'm a cheeseball is an understatement but I just can't help it! :) My house is feeling the love and it makes me happy! This month I am keeping it simple. I mean, it IS a short month after all right!? :) Besides a few goals, I also want to dedicate this month to focusing on my marriage with Drew. We don't "date" enough and have found ourselves letting work, finances, and stress really bring us down. So, I proposed February as date month for us. We are going to go on a date every WEEK and do cheap and fun things together that we always SAY "we will one day do". This month should be awesome! I'm excited for it and all the fun dates Drew and I have planned! 1. Post all of my summer sessions and weddings on the blog. WORK in progress. 2. Put pictures in my frames in the house. 4. Reveal my office. DONE! I still can't believe the response I had to it! Y'all are so awesome! 6. Have an awesome birthday dinner with close friends, family and colleagues. I had two! This is def. being marked off. 8. STRESS LESS. I still stressed, but I stressed LESS for sure. Goooo me! 9. Only drink water; NO more Dr. Pepper or soda. I did have a margarita on my birthday, but other than that, MISSION ACCOMPLISHED! 10. Change my domain on my blog from www.thenelsondiaries.blogspot.com to the domain I bought A YEAR AGO! I don't know how to do it yet, but it's time I stop putting it off haha! It will be www.soshayblog.com. I'll let you know when this happens. If anyone has any insight on this, please share!? :) DONE! 12. Set office hours and follow them. This was NOT easy but I did it. 13. Make Sundays NO WORK days. Drew and I want a day to relax, devote time to God and our marriage. A day of REAL rest if you will. :) Just, amazing. WHY haven't I been doing this sooner!? I'm posting mine tomorrow. I love that you did them simple with not extra added on to each friend. I love you and know everyone is going to love the new name. I'm excited to see the final product! Love you! I can never stress less! I don't know why but stress is the boogie monster in my world! Love this! Setting short term goals definitely makes them more manageable and achievable! I can't wait to read all about your business! And congrats on the no soda thing! You go girl!! Awesome goals! If you ever come to the big D let me know, I would love for you to take pictures of us!! Just saw something and thought this would go perfect in your office. Don't mean to sound creepy but you should check it out. It is on One King's Lane and if you aren't signed up I think you have to sign up to see it but it is worth it. Such great goals! I love that you're going to do a date every week! Jason and I definitely need to implement some more date time. Good luck! My fingers are crossed for you and I can't wait to hear the new business name. Good luck with the no soda goal...I've been working really hard to only drink water, but sometimes a big glass of soda just sounds so good! & I can't wait to hear your new business name!